Otto von Bismarck supposedly said “Laws are like sausages; it is better not to see them being made.” Freeheld is a movie about making laws, or, technically, the making of a decision by the Board of Freeholders, the equivalent of the County Commission in New Jersey. That decision, whether to grant the domestic partner of a dying lesbian police detective pension benefits, became a major struggle in the gay rights movement a decade ago. But, like Bismarck’s sausage making, it’s a movie that’s not always as compelling as it could be. 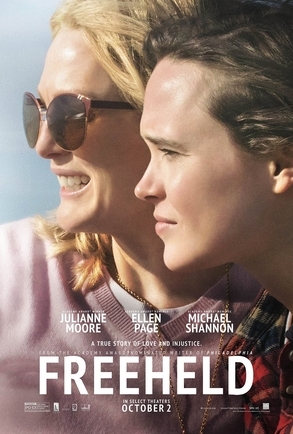 Freeheld is based on the story of Ocean County, NJ, detective Laurel Hester (Julianne Moore), a closeted lesbian who travels to Pennsylvania to avoid publicity when she enters into a domestic partnership agreement with the considerably younger Stacie Andrade (Ellen Page). The two buy a home and are quite happy together until Laurel develops cancer. As the disease progresses, Laurel becomes concerned whether Stacie will be able to stay in their home and keep up payments after Laurel’s death. That’s when Laurel learns that she has run afoul of New Jersey’s somewhat confusing and contradictory laws regarding domestic partnerships, the only avenue open at that time for gay couples to formalize a binding relationship. As a county employee, Laurel is entitled to a hefty pension that would go to a spouse when she died, but Stacie isn’t legally her spouse. Under the law in effect at the time, Stacie isn’t entitled to benefits, but, and it’s a big loophole, the Board of Freeholders can grant an exception in an individual case. Of course, having the power to grant an exception and actually granting an exception are two different things, and Laurel’s request is originally turned down. However, she and Stacie get support from two unlikely sources, Laurel’s straight cop partner Dane Wells (Michael Shannon) and a gay activist, Steven Goldstein (Steve Carell), to continue her fight. What was a small, personal issue quickly becomes a national bellwether for the gay rights controversy. And, at the same time, what had been a small personal movie about two woman falling in love and facing tremendous heartbreak becomes a larger movie about the political process. And in that process, the two lead actresses assume secondary, nearly passive roles in the movie. essentially ignores the women’s feelings and their wants in strategy sessions. His goal is the big picture, the legalization of gay marriage, and he wants to use their case to make that point. If gay marriage were legal, then Laurel’s plight would be a non-issue since Stacie as her spouse would automatically be entitled to the pension benefits. What Steven chooses to ignore is their lack of any desire to be the poster children for legalizing gay marriage. Making matters worse in that regard is Carell’s portrayal of Steven Goldstein as an over-the-top obnoxious New Yorker. Freeheld is based on actual events (and, indeed, an Oscar-winning documentary was made with the same title), and Steven is a real person who may or may not be that obnoxious in real life, but there’s no reason that director Peter Sollett and screenwriter Ron Nyswander couldn’t have toned down his character somewhat. The stereotypical Steven stands in contrast to the Board of Freeholders who seem somewhat surprised to get caught up in what at first seems to them to be a simple case of exercising financial restraint in not extending pension benefits too far. Only one Board member views the issue in religious and moral terms, but at first the Board goes along because of their tradition of taking all actions unanimously. Later, they are revealed to be a group of men looking for a way out of their dilemma without offending anyone, in other words, typical politicians. There is a certain fascination in seeing the political process play out in Freeheld, with characters coming to the right decision but not always for the right reasons. But audiences will likely be a bit disappointed because the politicking that dominates the second half of the movie overshadows the human story. Freeheld is one of the better depictions of a lesbian romantic couple I can recall, one that doesn’t ignore the political ramifications (Laurel is oh so careful to avoid revealing her identity to anyone, much to Stacie’s dismay), but one that doesn’t dwell on them either. Ellen Page may have her best screen role yet here as a woman who, due to the fact that she’s nearly 20 years younger than her partner, knows that she’s been marginalized but can’t fully accept it. She even manages to upstage Julianne Moore, who has the film’s showiest scenes in which she pleads for justice only days before her death. Director Sollett faced some difficult choices in making Freeheld, the most important of which was how to place his focus. In my view, he got it right, with one major miscalculation, the portrayal of Steven Goldstein. A film merely about Laurel and Stacie, especially played by these two actresses, could have been considerably more dramatic, but it would have merely been a movie about two women in love, with one of them dying. That’s the oldest theme in the history of cinema. What gives Freeheld its significance is the historical perspective, and it needs to be given more than lip service. The movie sacrifices some dramatic impact to show why Laurel and Stacie matter. A few characterizations, like Steve Carell’s activist, are out of place here, but, otherwise, Freeheld is an interesting portrait of a not too distant moment in the gay rights movement.